US Africa Command has warned against a terrorist plot being prepared by ISIS militants against Libya’s Oil Crescent, which is located 500 km east of the capital Tripoli, and includes the country’s largest oil reserves and export terminals. 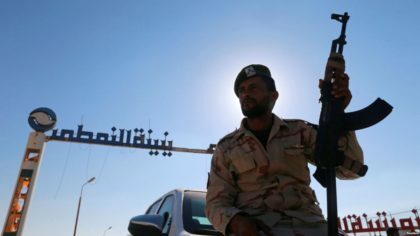 Since last year, the Oil Crescent has been under the control of the Libyan National Army, which is affiliated with the eastern government but working with the National Oil Corporation to protect the area from militant groups. According to Robyn Mack, ISIS-Libya would maintain its current strategy, which focuses on rebuilding its operational capabilities and exploiting areas under Libyan control, to destabilize the country and disrupt the political process. “The United States stands by its Libyan counterparts and supports their efforts to combat terrorist threats and defeat ISIS there”, stressed the AFRICOM official, renewing Washington’s commitment to continue to exert pressure on the terrorist network and prevent it from establishing a safe haven. On December 26, a group of gunmen blasted a pipeline pumping crude oil to Al-Sidra port, cutting Libya’s oil production by up to 100,000 barrels per day (bpd), igniting world crude oil prices. According to some experts, Libyan instability offers extremist groups an opportunity to operate in a country where thousands of migrants and refugees are trapped suffering abuse and mistreatment. And although ISIS no longer holds territory, cells of fighters remain active across the country. These cells, together with several Al-Qaeda-linked groups with ties to wider networks throughout North Africa and the Sahel, pose a threat to Libya, neighboring countries and Europe. The oil-rich country’s economy has collapsed, and Libyans are struggling with persistent energy, food and water shortages. Meanwhile, corruption is rife and cross-border organized crime and smuggling networks dealing in anything from migrants, to weapons, drugs, fuel and other goods are flourishing. In their efforts to fight Islamic extremists and prevent human trafficking across the Mediterranean, European governments have provided support to local security forces, which are often militias with tenuous links to political authorities. Amnesty International accused European governments of complicity in the ‘horrific abuse of refugees and migrants’, claiming that many of the same militias Europe partners with were directly involved in torture in detention camps across the country.